As summer is coming to an end I am trying to get my diet back on track. With all of the traveling and play days with the kids I feel like I need to detox and eat something super healthy. Adding a lot more raw foods into my diet makes me feel so much better. Especially if I have been indulging a little too much. This salad is perfect. Plus the kids loved it too! 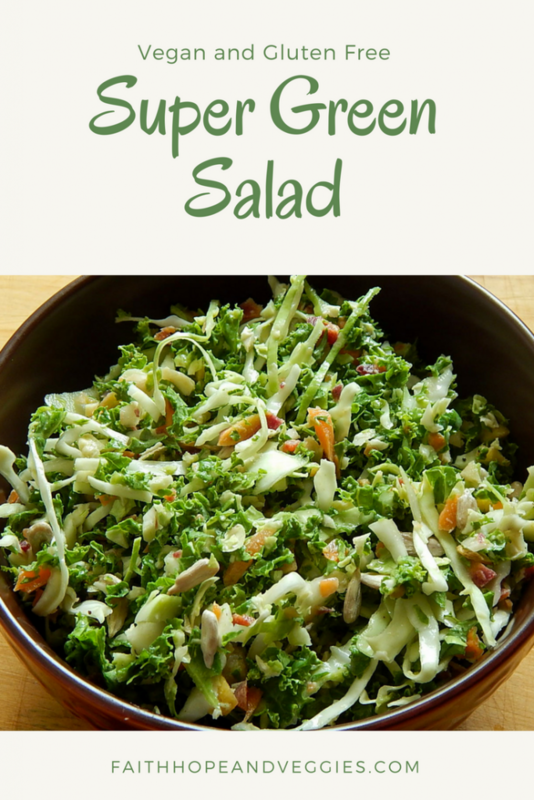 The food processor does most of the work to make this salad. 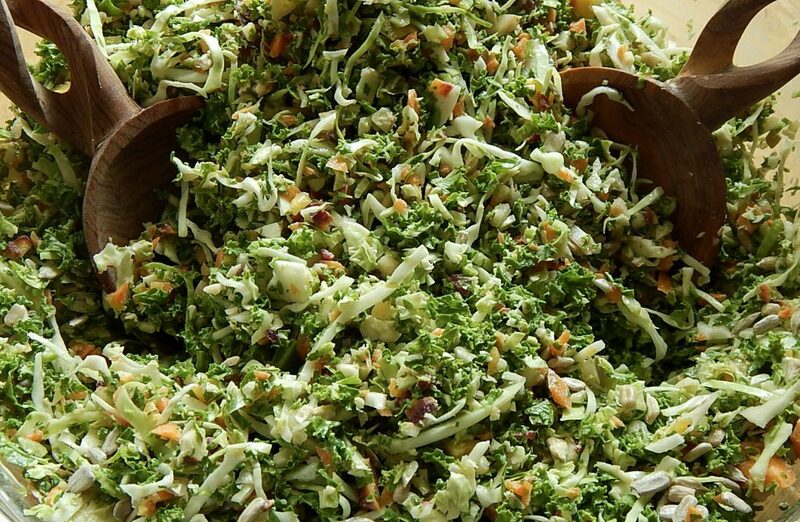 I shredded cabbage, brussel sprouts and kale for the base and then added in more veggies and sunflower seeds. The dressing is made with lemon and tahini so it is creamy, tangy and gives the salad tons of flavor. 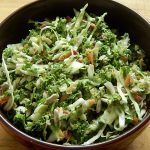 This salad is perfect on its own or you can add in some additional protein. 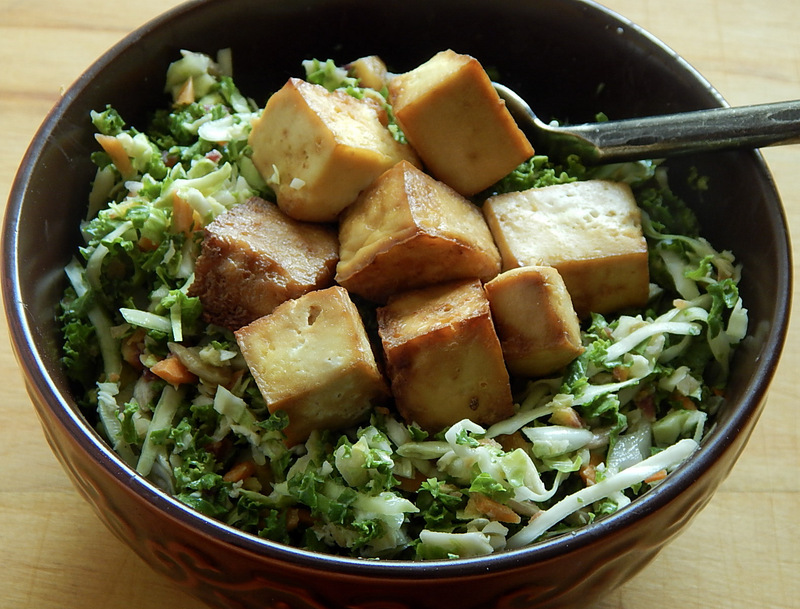 I really like it with baked tofu. You could also add is some roasted chickpeas or baked tempeh. This makes a big batch so hopefully there will be leftovers for lunch the next day. It only gets better the more time it has to sit in the fridge and let all of the flavors come together. Also try this kale and sweet potato salad for another super healthy meal. Remove the core from the cabbage and shred it in a food processor or with a knife. Put it into a large salad bowl. 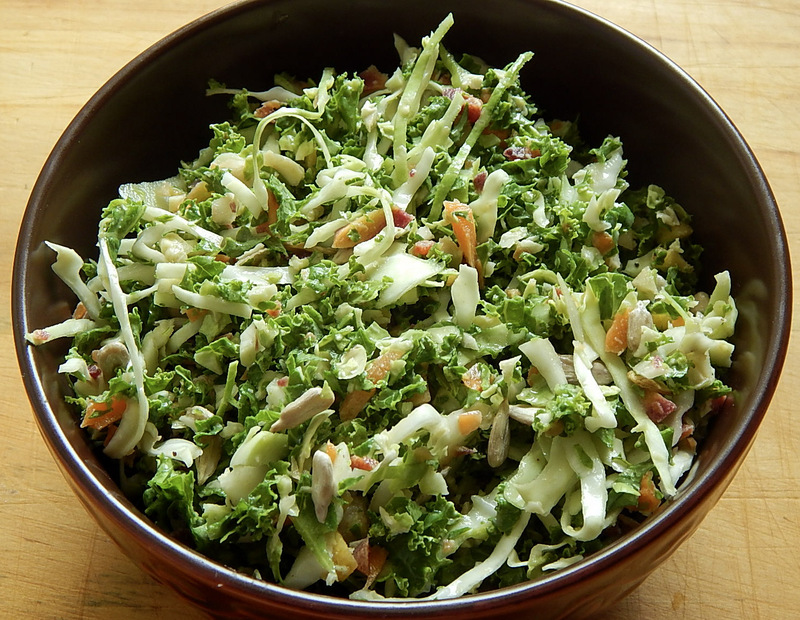 Pull the kale leaves from the stems and pulse them in the food processor just to chop them up into small pieces. This may have to be done in batches. You can also chop the kale with a knife. Add it into the bowl with the cabbage. Trim the ends from the brussel sprouts and put them into the food processor. Pulse until the are finely chopped. Add into the bowl. Peel the carrots and cut them into large pieces. Put them into the food processor and pulse until chopped. Add them into the bowl. Add in the sunflower seeds. Optional: Add in any additional chopped veggies that you like. Mix all of the veggies together and then make the dressing. Pour the dressing over the veggies and toss it all together until everything is completely coated. Cover and keep in the fridge until ready to serve.